Saoradh members and supporters with fireworks seized in Creggan this afternoon. Members of Saoradh have seized fireworks from young people after mounting patrols in Creggan this evening. In a statement the group said it had been "inundated with complaints over the past number of weeks and have proactively worked to resolve this situation." It said it had "undertaken a decision to actively patrol the areas surrounding Creggan shops, Central Drive, Rinmore Drive, Cromore Gardens and Creggan Heights". 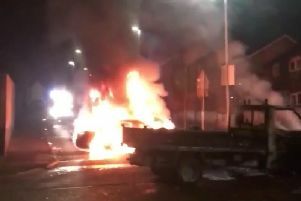 Two weeks ago Saoradh called for vigilance from parents after fireworks were reportedly aimed at pedestrians, motorists and local shops in Creggan.